STUDENT BODY BREAKDOWN: Total enrollment is 1,400+; 650 full-time undergraduate students on campus; 37 states and 32 countries represented; 10% of our undergraduate population were home educated. HOUSING & DINING HALL: Freshmen and sophomores live in one of our three residence halls; juniors and seniors live in our Terrace Housing, or in other words, apartment-style housing. All students have access to our newly renovated multimillion-dollar dining hall. 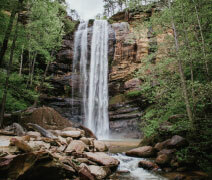 At Toccoa Falls College, be prepared to be adventurous. 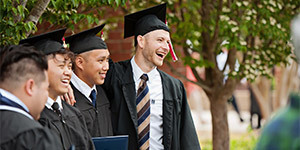 TFC is located in the foothills of the Appalachian Mountains in northeast Georgia, and for the last 107 years, we have been an active and passionate Christian college that provides our students opportunity to grow in their faith, in their studies, and in the community. With over 30 different academic programs, a vibrant student life, and incredible outdoor scenery and opportunities, TFC is a perfect place to call “home” while you pursue your degree. At TFC, we carry out our mission and vision with passionate faculty and staff. For our students, we uniquely integrate biblical truth, academic excellence, and intentional spiritual formation within a caring Christian community. We’re both authentic and genuine, and not only when it comes to your success in the classroom. We want to foster a culture of Christian leadership within you when it comes to you growing in your faith. Our students are challenged to grow in their faith by being involved in small groups, regular chapel services, student-faculty mentor relationships, Service and Outreach opportunities within the local area, and many more spiritual growth opportunities that you’d have the ability to take advantage of by attending TFC. What’s different about us? You’ll never be alone in your continued growth in your faith. Whether it’s our Campus Pastor, a professor, or somebody else, you’ll have individuals walking with you in your walk with Christ. TFC is unique because we’re serious about our faith as well as our academics. We have 35 majors to choose from, along with 43 minors. Whether it’s Nursing, Cross-Cultural Studies, Sports Management, or anything in between, we have something for everyone. With an average class size of 13 students as well as a 15:1 student-faculty ratio, TFC provides students with an intimate and intentional experience in the classroom. Ready for the adventure? Whether it’s rock climbing with our Outdoor Club, tubing down the Chattahoochee River, catching a TFC basketball game, or going to a Third Day or Lecrae concert on campus, TFC has something for everyone who has an adventurous spirit! TFC has over 15 student-led organizations and clubs ranging from the Theatrical Society, which puts on theatrical performances, to the Justice Campaign, which supports and promotes social issues such as poverty, homelessness, and refugee crises. No matter what you’re called to do in life, TFC’s campus community not only gives you a great college experience, but it puts you in life-changing environments. Contact our Admissions Office today to set up a visit so you can see if this is the place for you. You can meet with your admissions counselor and a particular professor, take a campus tour, eat in the dining hall, sit in on a class, and walk away with some TFC gear. We want you to experience the TFC adventure for yourself!